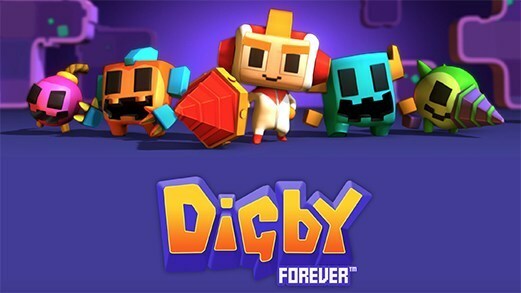 Digby Forever by 3 Sprockets takes its cue from classic video games, but this isn’t just another pixelated mobile game. Basically this is an action adventure game where you collect gem and precious stones and go down as far as you can. But there is more to this Digby Forever than that. The gems you collect are turned into coins. Unlike other mobile games however, if your character dies you will commence where your left off. This is nice because it means you don’t have to start from the beginning, but that does not mean Dgiby Forever is a cakewalk. There are lots of opponents in your wary, and you should watch where you drill down to as dangers await. The enemy gallery is vast, including creatures, lasers, lava and many others. Some of these will go through you and others will hunt you down. You also need to be careful about the bombs you use to destroy the bricks and drill down. While it is an effective weapon in getting rid of enemies, you have to steer clear so it does not hit you as well. The further you drill down, the more enemies you will encounter but the more gems you can collect. However you can avail of ability cards which let boost your life increase drilling speed, and so on. You can also customize the game’s look by the skins you can uncover as you dig deeper into the game. Bottom line: Digby Forever is a quality game and one you’ll want to keep coming back to.